Arsenal manager Arsene Wenger says a gay Premier League footballer may never be able to reveal his sexuality during his playing career because of the intense scrutiny he would be under. 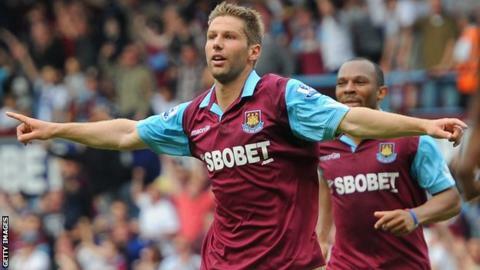 Former Aston Villa midfielder Thomas Hitzlsperger came out earlier this year after his retirement from the sport. "Because of media interest, maybe no-one will come out," said Wenger. "He could not come out during his career which means we still have some progress to make in our game." Wenger's comments echo those made by former Leeds player Robbie Rodgers, who said it was "impossible" to contemplate coming out and remaining in football. Like Hitzlsperger, Rodgers came out after bringing his playing career to a close. Lower down the football pyramid, semi-professional player Liam Davis has come out and continued his playing career. And in women's football, Casey Stoney has continued to play at the top level for Arsenal Ladies and England after revealing her sexuality earlier this year. Wenger, talking to Arsenal Magazine about the issue of homophobia in football, said the day when a player's sexuality was not an issue in football was still a long way off. "Hitzlsperger should not have had to wait until the end," he added. "But overall he should not have to come out at all because it should just be considered like anything else. "It would be good if four, five, six people come out and after that nobody speaks about it anymore because they just think it is people who live their life like they want to live it. "I think football is there to provoke moments of happiness, excitement and positive experiences in people, no matter where they come from, what colour skin they have, what religion they are or what their preferred sexuality is. "It's very sad that some people think that this sport should only be reserved for those who have certain characteristics. It's open to everybody who loves football and when that doesn't happen, it's not acceptable." A survey carried out by Europe's leading gay equality charity, Stonewall, which polled over 30,000 fans from 29 countries, found that Irish football supporters would be the most accepting of a player in their national team coming out as homosexual, with 83% saying they were comfortable with the idea. Sweden and Denmark followed next with 79% ahead of the United Kingdom with 73%, while this summer's World Cup host nation Brazil came sixth (67%). Supporters from Kuwait and the United Arab Emirates (both 7%) had the lowest acceptance rates of such a scenario.